Previously, Led Zeppelin I had released the best editing compilation from the 1973 American tour, but such a concept never existed in Floyd. Total concept in both album and stage carefully Because of grouping, maniac could not have thought of such a comp. However, Taper, who calls for “Jimfisheye” last year, has produced groundbreaking compilations for Floyd ‘s live tone generator and is publishing it on the net. 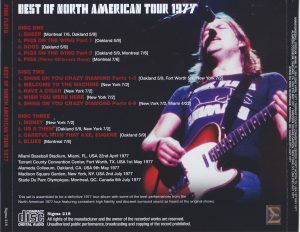 “Best Of North American Tour 1977” which will be released on this limited press CD this time. 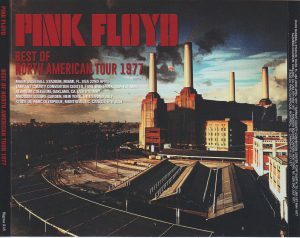 It is a concept that it was not likely to be possible with Floyd so far, but Jimfisheye seems to be a very accurate judgment from the 1977 Animal’s America tour that he tried to make “a definitive 1977 tour album” as he said It seems. Although the sound board recording is not excavated on this tour, the audience recording of the finest sound quality that makes it want to call “as if it is a sound board” instead is rustling instead. In addition, the tour himself also played neatly From the European to the United States where each person’s play and Roger’s song etc. often show different expressions depending on the day, as a floyd’s first live tour compilation, this striking There is no time to put on. All original sound sources are adopted carefully selected the best version. Moreover, it covers all the songs played on tour with three discs in the order of set list. First of all, the evergreen Evergreen, occupying the majority of the first piece, Auckland. Recording sounds are more representative of animals tour than you can describe, but since this recording began suddenly from the intro of “Sheep”, the state before the performance was patched in Montreal on the last day of the tour. Of course, if you fill all the performance of one disc with Auckland take, there is no meaning of compilation. So the first disc, the other day is what guitar solo of “Pigs on the Wing (part 2)”. It switches to Montreal from here. You can see the concept that Jimfisheye might have aimed at this editing. In Auckland’s song, there was a place where Snowy White did not play solo (which was also the charm of the day) and I switched to Montreal’s take to hide it. In other words, it seems that you combined a number of takes together like an official live album and finished it to a more complete version. 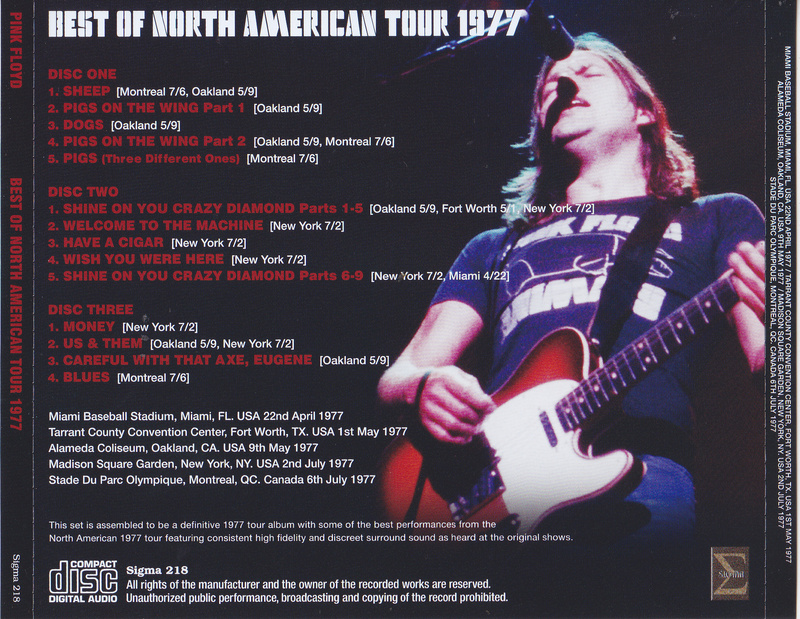 Since the first disc finishes in Montreal as it is, it is interesting that the familiar Auckland animals set closes the curtain with the Montreal version of Roger screaming “Pigs”. The second one is the main feature of MSG second day, which is the name sound source which is called “second set” in the animals tour. 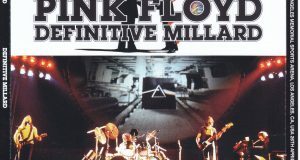 However, “Shine On You Crazy Diamond (Parts IV)” quotes Jimfisheye as well as MSG as well as Auckland to Fort Worth in May and has been finished in the best condition he aims. In that case, I thought how to do the latter half of “Shine On You Crazy Diamond (Parts VI – IX)” which was a painful cut, and has a unique sense to compensate in Miami in April. Regarding the third piece, I made edits that made use of the three major sound sources of Auckland, Montreal, and MSG second day I have mentioned so far. Especially “Us & Them” is the finishing of complicated editing with Auckland and MSG, and as for “Blues” which finished the last day of the tour, as for the case of multiple sources We combine them. 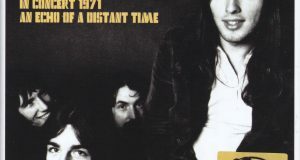 By this it spitted out to the audience, and it is possible to recreate the appearance that the other members and the audience are confused in the blues · jam played by encore by Roger ‘s arbitrary cut off completely. It is a compilation that Jimfisheye put together by compilation of such incoming soul, but there are coarse scenes that “Careful With That Ax, Eugene” and “Blues” are recorded while the pitch is high. Both of them are famous one-off performances on the tour, so it is painful to miss those pitch misadjustments. Naturally these issues are also firmly adjusted. Of course, there is no improvement of the novelty part and the sound quality, but rather the sound source itself is rather just a famous audience recording with a feeling extremely tasted by items of Sirene and Sigma. Nevertheless, the sound source choices and edits mentioned above are also certainly splendid, and from beginners to maniacs can be enjoyed very much, the finish suitable for calling this animal’s tour · anthology is masterpiece!